Deconstructed? Yeah. First mistake was that I bought bacon instead of pancetta. Not sure why I made that choice at the store. But not only did I buy bacon, I bought thick sliced bacon. I tried to wrap the meatballs with those thick slabs of bacon but it was not happening. Sigh. 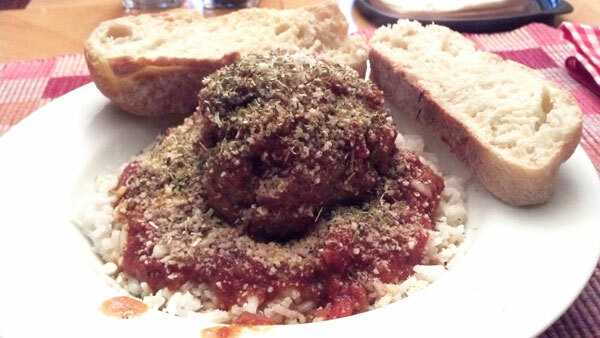 I ended up unwrapping the meatballs and browning the bacon and adding that to the sauce! Complaints... no because this was quite good. The aroma in the house was fantastic. I think I even saw the cats smiling. Oh you want the recipe. Click here and plan on spending some time at this site.